Does anyone have the stats cap for this set? Posting here so I can find it easily later. I'm at work right now, but I have the stat caps on my home PC, so I'll get them for you and edit this post when I get home. Probably be about 5-6 hours from now. And here's a picture for proof. Note that I only needed a single Craftsman's Competence 3 material in the offhand in order to hit the 347 that you need for 2-Stars. After that, it's your choice what you want to meld into your offhand for additional stats (you won't be able to hit all of the stat caps on the offhand, but you've got 14Craft/11Control/3CP remaining before you hit the stat caps on it). I'm also missing 2 Control on my Belt, 4 Control on my Wrist, 1 Control on my first Ring and 4 Control on my second Ring, so without even looking at my Offhand, I could have 331 Control. 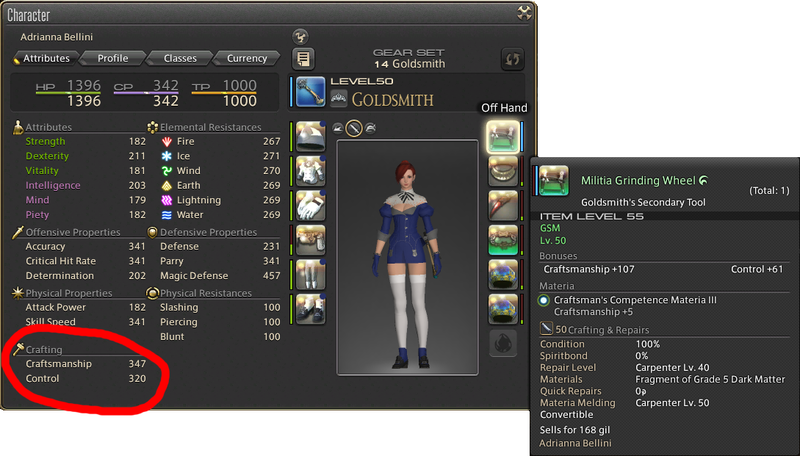 Additionally, I'm missing 3 CP on my Coatee, but that's another piece that I don't think you can hit every stat cap on before running out of spaces for materia. Other than the offhand and the body piece, you should be able to hit every stat cap on every piece of equipment as long as you're willing to bash your skull against the RNG of material melding. I should also note that the picture above is without food. Last edited by Norbi; 11-06-2013 at 08:19 AM.